Hi....I know this thread is somewhat a few months old. But I have been researching about paludarium and I have come across your thread. I have 6 FW tanks but I am planning to make my 6th tank (10G) a paludarium. With your eggcrate, i know it was visible but how did you end up covering it? Did you end up foaming it or just covering it with moss? And how the soil stayed up there without leaking in the water area? Also, I know in the bottom area, you had some PVC tubing to hold the egg crate. How did you cover that one as well? Sorry for all this questions. I just wanted to create this project as cheap as I can. Did you have a filter and heater? And do you change the water as frequent as you change FW tanks? Thank you for your advance answers! Currently going to school, and I just started my own business. 55 Gal Tropical FW - Bala Sharks, Gouramis, Barbs. 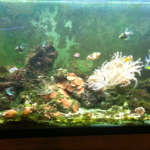 55 Gal Reef - Soft Coral, LPS Coral, Firefish Goby, Ocellaris Clown (2), six line wrasse, yellowtail damsel. 20 Gal Cold FW - American Flagfish, Mosquitofish.